Back in April, we told you about one of those collaborations so head-smackingly obvious it was hard to believe it hadn’t happened yet. 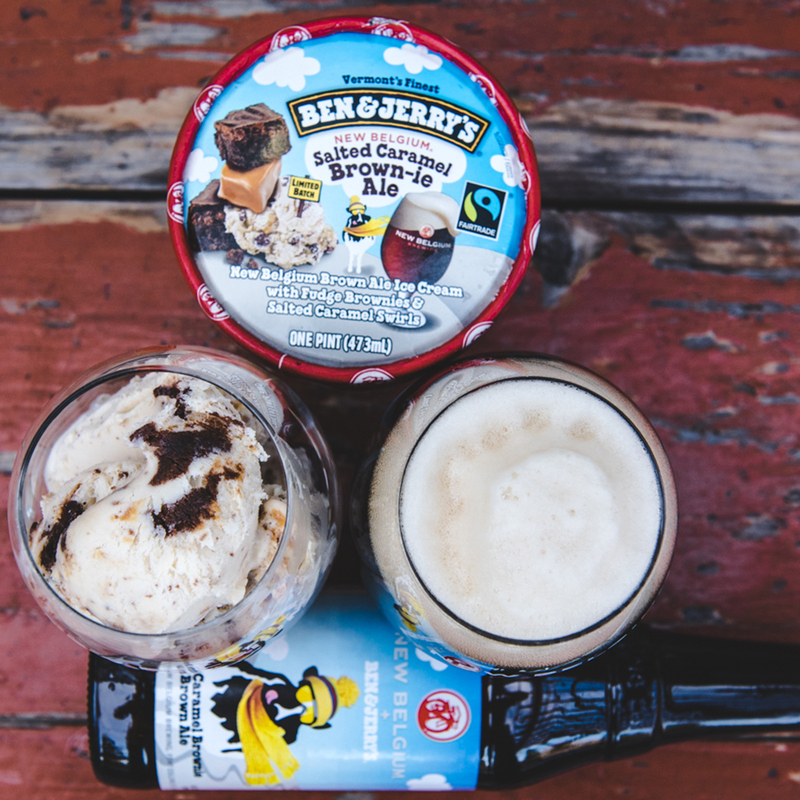 New Belgium Brewing and Ben & Jerry’s, both B-corps focused on issues of sustainability and environmental impact, teamed up to create a salted caramel brownie ale. The project would benefit Protect Our Winters—a group working with the winter sports community to combat climate change. But today the companies announced the second half of their partnership. First came ice cream beer; now it's beer ice cream. The newly revealed Salted Caramel Brown-ie Ale ice cream uses a substantially less boozy version of the bottled beer, which comes in at over six percent ABV, as part of its base, along with chunks of brownie and caramel swirled in. Sitting with real live B&J flavor guru Eric Fredette (yes, he’s one of the guys who dreams up these flavors), we got to open a pint and a bottle. There’s always a danger with combinations like this that the flavors just won’t blend well—that cramming booze and food together will come off more as a desperate cry for attention from recently graduated frat boys. Thankfully, that’s not the case here. The beer is certainly on the sweeter side (it’s named after brownies, what did you expect?). So if you insist on keeping your fridge stocked exclusively with double IPAs, it’s probably not for you. But if you want something chocolaty and more malt-forward to drink after dinner as the weather gets colder, the brownie ale fits that bill nicely—especially if you don’t want something as heavy as, say, a porter or a stout. The ice cream has just a touch of extra malty flavor imparted from the beer, but mostly it just tastes like an excellent brownie sundae. For our money, though, the two tasted best together. We’ve had plenty of beer floats in our time and rarely do they work when the ice cream has huge chunks of anything in it—brownies, cookies, birthday cake. Usually we’re left with soggy, beer-soaked baked goods at the bottom of the pint. Here, probably thanks to the heavy chocolate influence in the beer, the concoction worked, even as the ice cream melted into the glass. You can pick up pints and six-packs for your own float-making purposes now. Can Ice Cream Help Stop Climate Change?